Today we went to Winter School and learned about Winter Fun. 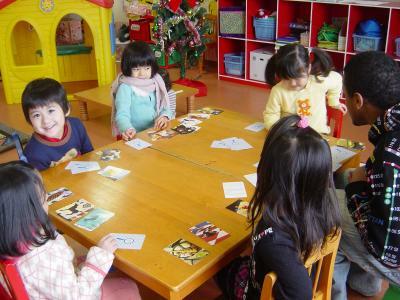 Many places have a lot of snow in winter, and children can see beautiful snow flakes, and build a snowman! Last week we at Apple Bee held our annual Christmas party! 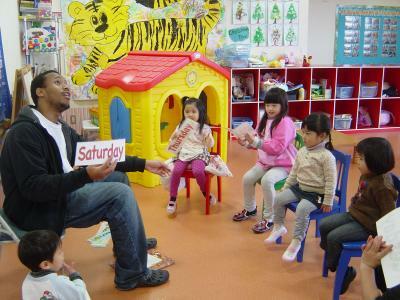 Everyone had a great time singing songs and playing games. 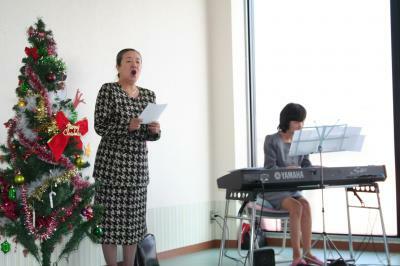 Our performance was a success, we even had a nice concert presented by a student’s grandmother. She has a beautiful voice!Afterwards we had a wonderful potluck with many different foods. Pizza, chirashisushi, and even tasty home made banana pudding! 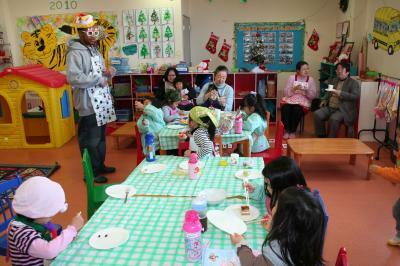 Everyone had a great time at our Christmas party, and we are planning an even better New Year. 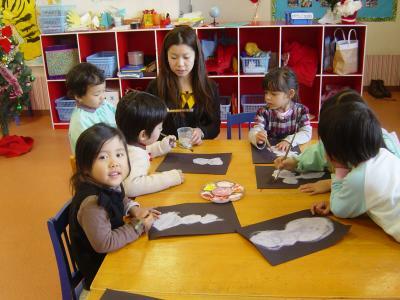 Happy New Year to you all from Apple Bee International School! Lunch time is one of our favorite times here at Apple Bee. 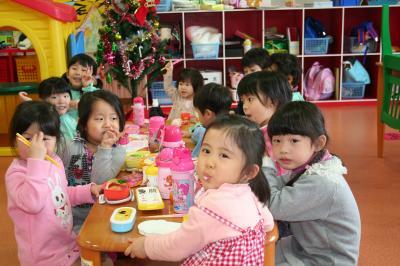 A good nutritious lunch is important is important for growning minds and bodies.We love lunch time. Tomorrow we will hold our Apple Bee Christmas Party. We practiced very hard, and we can’t wait to perform before our parents and teachers.Please wish us luck! 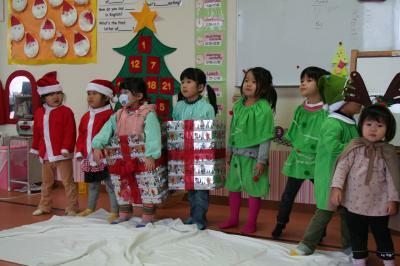 Today we had a dress rehearsal for our Christmas play. Now we’re ready! 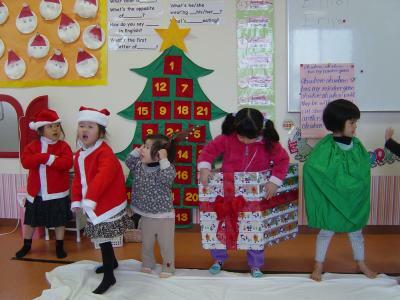 we practiced Christmas songs for our upcoming Christmas party. 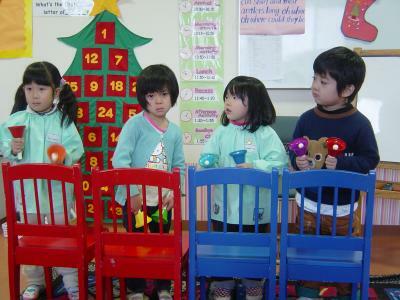 Many Christmas songs are easy and fun to sing in English. You should try it! 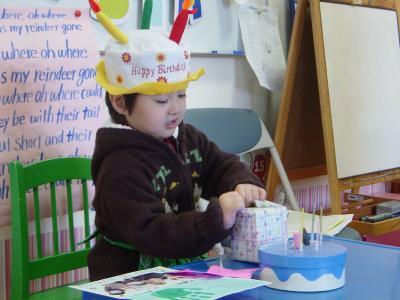 Today we had a birthday party for our December student, and birthday boy’s parents brought cake for everyone to enjoy! Happy birthday to everyone born in December! 今日は１２月生まれの誕生日会でした。歌をうたったりワッフルを作ったりして楽しい時間を過ごしました。バースデーボーイのご家族から ケーキの差し入れがありみんなで楽しくおいしくいただきました。Thank you very much. Today we practiced playing “Jingle Bells” and “Joy to the World” with hand bells. On December 9th, Kumamoto city issued a Norovirus (food poisoning) warning. It is very important that our hands be kept clean. 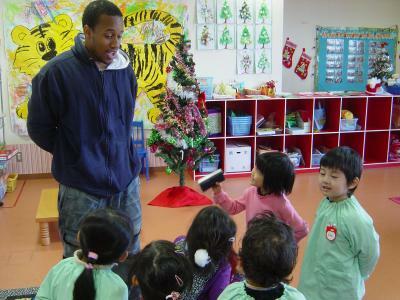 To ensure we take enough time washing, our teacher taught us to sing “Happy Birthday” twice when washing our hands. Please keep your hands clean, and your body healthy! 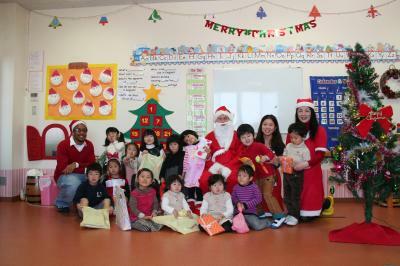 Today our teacher read us the Christmas story, “Get Dressed Santa!”. It’s all about Santa getting dressed before getting on his sleigh and delivering toys.Hurry up Santa! It was cold this morning, and we wished it would have snowed. Even without snow, we found a way to make our own snowman. We will be holding our annual Christmas Party on Thrusday, December 23rd. We are practicing very hard for our performance of “Santa’s Helper,” an original play written by our teacher. We want to do a good job. We will do our best! Today we played “Dress Santa”. We made teams and raced to see which one could dress Santa the quickest. Hurry up! Santa, Santa, Where is Your Sleigh? Today we played the game “Santa, Santa, Where is Your Sleigh?” In this game we make a circle and take turns sitting inside and gussessing who in the circle has Santa’s sleigh.I found it! Today we made Christmas stockings from colorful construction paper. Stockings are similar to socks, only much longer, and are sometimes used as Christmas decorations. Stockings are empty when hung, then Santa fills them with goodies on Christmas Eve. Today we made Santa Claus figures with paper cups. 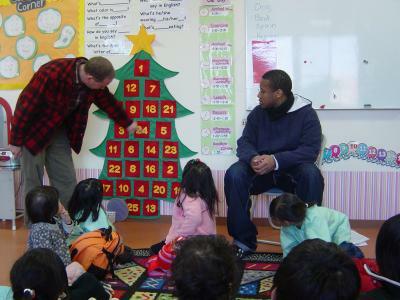 Today our teacher taught us about the Advent calendar. This calendar has 25 days, from December 1st, to Christmas, December 25th. Santa will be putting a present in a pocket each day, and we will take turns getting a present and counting the days to Christmas.Christmas is fun!